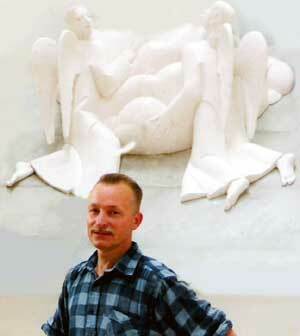 Lithuanian Sculptor STANISLOVAS KUZMA was born in Panevezys city, Lithuania, on May 7, 1947. In 1973 graduated from Vilnius Art Academy. Since 1972 he has exibited in Lithuania and abroad. Kuzma creates large- and small scale sculptures, of which he has made about two hundreds. Private collectors in Lithuania, Germany, Russia, Japan and USA have acquired his sculptures. One of them was presented to Pope John II and another to the United Nations. The Ludwig collection in Cologne, Moscow Tretjakow Gallery also has several of his sculptures. The Lithuanian National Olympic Committee gave the International Olympic Committee's museum in Lausanne sculptures too. E.J.Domanskis sponsored the erection of sculptures Fair Lady and Queen's Prayer at Frederick Lowe Vilig Park in Palm Spings, USA. Sculpture The Shot was displayed in Olympia Park of International Olympic Academy, Greece. The sculptor still treasures the 1987 Moscow Art Academy Award for his Sundial in Siauliai city, Lithuania. Kuzma is the laureate of Lithuania State Award in 1982 and Lithuania National Award in 1996. Lithuania Grand Duke Gediminas 3rd Degree Order Bearer. Bureu Member, Sculpture Section, Lithuanian Artists Association. Member, Lithuanian Culture and Art Council. Member, Commission on Monument and Memorial Plaques Building, Vilnius City Council. Please get in touch with any comments or reactions to my artworks.